Do you have a question for Kevin O'Leary? 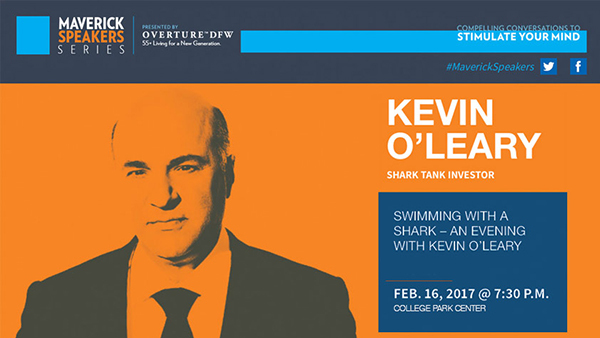 The Shark Tank judge may answer it at his Maverick Speakers Series appearance at 7:30 p.m. Thursday, Feb. 16, at College Park Center. Send questions to maverickcommunications@uta.edu or share it via social media using #maverickspeakers. Questions selected will be shared during the question-and-answer session following his lecture. The frank and opinionated O'Leary is one of North America’s leading business moguls. O'Leary’s track record in business success began with The Learning Company. As an “eco-preneur,” O’Leary focuses on investments that make money while being environmentally friendly. He is also co-host for Discovery Channel's Discovery Project Earth and is the author of three best-selling Cold Hard Truth books. VIP packages include a private dinner and photograph with the speaker. Preferred seating has front-of-the-line access to the venue. The lecture is free for students, faculty, and staff and costs $5 for community members. Tickets are available at utatickets.com. LEARN MORE. Parking near the Maverick Activities Center changes this week for construction projects. 65 parking spaces in Lot 33W are closed for water line construction. Portions of Lot F6 will close Wednesday, Feb. 8. The ADA spaces on the north side of the MAC remain. Trinity South lot will have 46 spaces change from student to faculty/staff parking. Student parking has been reallocated in University Village, Arbor Oaks, Meadow Run, and Cooper Chase apartment lots. UTA complies with the Drug-Free Schools and Communities Act that requires institutions of higher education to design and implement alcohol and illicit drugs programs on their campuses. In compliance with the Act, the University has adopted and implemented a program to prevent “the unlawful possession, use, or distribution of illicit drugs and alcohol by students and employees” on University property or as part of any University activity. 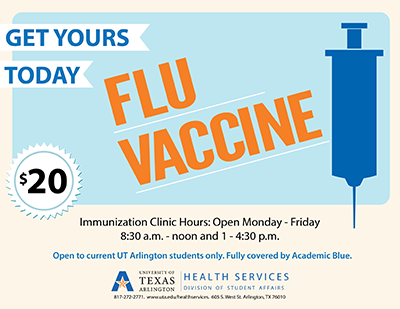 The UTA Bookstore will be closed Saturday-Sunday, Feb. 11-12, for its annual inventory. Shop online. Starbucks by the store will be open.